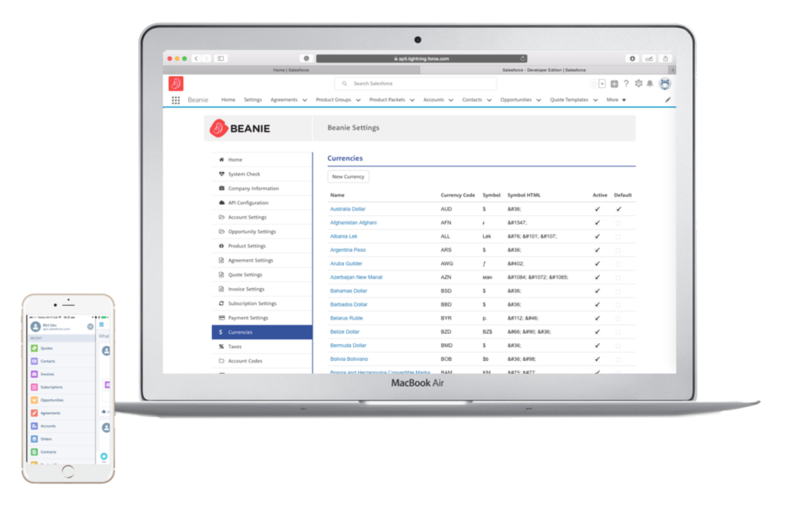 Beanie integrates with your existing Salesforce CRM (Sales Cloud EE+) and empowers you to make full use of your client data in Salesforce to automate your quoting, contracts, ordering and invoicing. Create quotes, secure digital signatures, automate invoices. Create webforms, take online orders or sales and update opportunities – even take credit card payments. Create any kind of contract, manage your terms and conditions, secure a digital signature and file everything in Salesforce where it needs to be. Dashboard invoices in seconds through a plug and play connection to Xero and Quickbooks. Manage and automate your selling process from Quotes to contracts, orders and Invoices. Automate orders and set up order templates. Credit card integration for fast payments. Use automated customer account setups for faster account creation. Work with products and map account codes from Salesforce to Xero and Quickbooks. Brand your invoices and quotes. Set up templates for fast quoting. Beanie is available in beta from the Salesforce AppExchange, and has a straight-forward subscription based pricing structure. Stress free and simple. Just like jelly beans. If you want to chat with someone about Beanie, give us a call on 1300 859 323 or send us a message. The Beanie finance & contract automation app has been designed to be installed by any Salesforce admin from start to finish. Add products to quotes, link to orders, sync with Xero account codes. Link products to supplier orders, customise order templates + more. Creating new fields for order templates from within the app settings. Multiple subscriptions types, automate payment collection + more. Create quotes on opportunity, product packets, templates + more. Build multiple web forms, customise look and feel of forms + more. Link to marketing automation platforms to trigger customer communication, e.g. Pardot, Marketing Cloud, Google Analytics. Automate account data, in-built account sign up forms + more. Customise agreement terms, automate contract creation + more. Beanie puts your subscription sales and reporting on automation saving your finance team massive amounts of time. Clients can manage their own subscriptions online via automated visual force page. Add, update credit card details. Can view all upcoming payment cycles, view historic invoices and check out failed invoices payments. Create Salesforce reports and dashboards from all your live and native data. Beanie brings your finances to life empowering live reports and dashboards in your organisation. By automating your quotes, contracts, invoices & orders and syncing your payments directly with Salesforce you can build powerful & insightful dashboard right in Salesforce. Empower your leaders and managers with real time financial reporting. Automate invoice creation, custom templates, PDF + more. Sync with Xero, Quickbooks, map account codes, add eWay Merchant account. Sync invoices with Xero, take credit card payments via eWay and automate your financial processes. Multi-company management for Xero enabling single Salesforce org automating revenue recognition to multiple Xero orgs. “Beanie has saved our team a minimum of 120 hours per month! 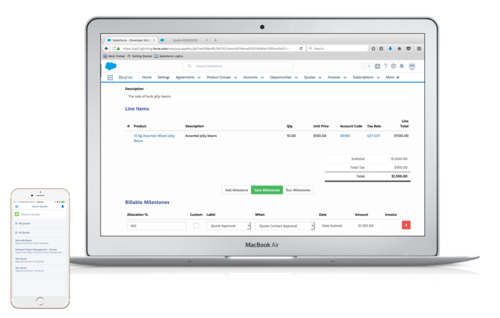 We no longer have to manually enter invoice data into Salesforce reports or continuously communicate between finance and sales to let them know about the payment status of a clients’ invoice.